Ever have a class that gets off on the wrong foot and stays that way? How you start your class has a huge impact on how receptive students are to learning. It’s no different from those days when you wake up on the “wrong side of the bed” and struggle to be productive the whole day. This is precisely why we encourage starting class with ASSET. Leading an ASSET tool at the beginning of class allows your students (and you!) to hit pause before engaging in rigorous academics; this helps everyone find a place of calm, which improves focus and productivity. 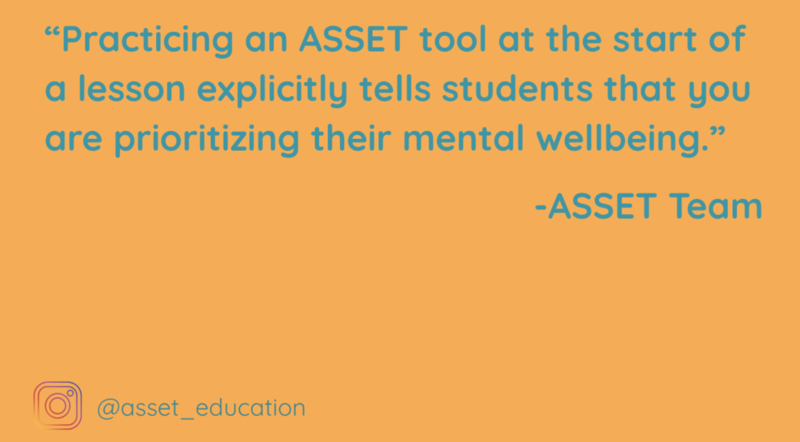 Also, practicing an ASSET tool at the start of a lesson explicitly tells students that you are prioritizing their mental wellbeing, which increases the odds of student buy-in for SEL and course content activities. For more information on the importance of starting class’ productively and suggestions for bellwork activities, check out this article from Edutopia.